How much did Tesla pay Elon Musk for all his work as CEO last year in salary? Well, looking hard in sunglasses and brow-beating the New York Times into submission is worth $69,989 American, compared to about $23.2 million for Alan Mulally. Granted, since he owns a quarter of the company and was given $78.2 million in 2012, it's not that big of a hit. If anything, this just goes to show how strange executive pay is since the stock price rise netted him many times that. Musk's large option award in 2012 was intended as compensation over a 10-year term, based on achieving specific goals, the company said in the filing. Those include the market capitalization reaching $43.2 billion within a decade; it's $25.8 billion now and was $3.9 billion at the end of 2012. To get the full value, Tesla also must expand its lineup with the Model X sport-utility vehicle, a lower-priced sedan, and raise its electric vehicle production to 300,000 units annually with Musk still at the company. Sorry Skrillex, FoMoCo had the bad kind of drop when first-quarter profits were off nearly 39% because building cars in North America is expensive, with total profits of just $989 million on revenue of $35.9 billion. Ford incurred $500 million in charges that included warranty reserve increases related to recalls of prior model year vehicles and weather-related costs. About $400 million of that was due to field service actions, which includes costs associated with recalls, customer satisfaction updates and other safety claims. The costs are not from current vehicles, but those sold in 2008 to 2013, Ford chief operating officer Bob Shanks said. In positive news: Europe didn't even lose $200 million! Having record profits sounds like a good thing, but at Volkswagen it may be a little misleading given how they got there. Volumes are way up, and sales keep rising, but but their huge investment and expansion has been matched by a weak profit increase of just 3.5%. Here's how Reuters breaks down why they're not making as much as they'd like out of their core brands, which includes labor costs, expansion costs, currency mark downs, and heavy incentives. Or put another way: Imagine you own a pizza shop, you sell 1,000 pies a week and you make $2 of profit for each pie. In a bid to expand you start hiring more chefs, drivers, and invest in a cheaper sauce recipe. You make 2,500 pies a week now, but you only make $1 per pie because of increase costs and the need to offer more coupons to get the pizzas into people's hungry mouths. Sure, that's $500 more profit, but you're making diminishing returns. That's basically VW right now. The good thing is, to torture this metaphor, you also own a fancy sausage (Porsche) and luxury burrito (Audi) shop, and both of those are highly profitable. The South Korean won is still high, which isn't great if you're trying to export cars, but that didn't hurt Kia too much as it saw a 12% rise in profits in the first quarter. The company's profit last year was hit by one-off provisions to cover recalls of 630,000 midsize sedans and sport-utility vehicles in North America because of defective brake systems. Kia had set aside 48 billion won in the first quarter of 2013. Meanwhile, operating profit rose 4.5% to 736 billion won, while revenue increased 7.6% to 11.93 trillion won. "Despite the unfavorable business conditions, notably the won's strength, increased sales prices of some key models also contributed to the growth in operating profit," the company said. As the market expands and matures the era of crazy quarterly profits for a wide swath of automakers is probably over, at least for this year. Because GM didn't have enough to worry about lately, the SEC is now looking to see how the company reacted to the ignition recall. GM's document said the SEC is investigating its handling of the ignition switch defect, which engineers first discovered more than a decade ago but failed to fix despite a change to the component approved in 2005. I don't get what the recall has to do with college sports, but there you go. On this day in 2001, 44-year-old Italian race car driver Michele Alboreto is killed on a track in Germany during a test drive. Alboreto collected five Grand Prix wins on the Formula One (F1) circuit, where he competed during the 1980s and early 1990s, and also claimed victory at the 24 Hours of Le Mans endurance race in 1997. 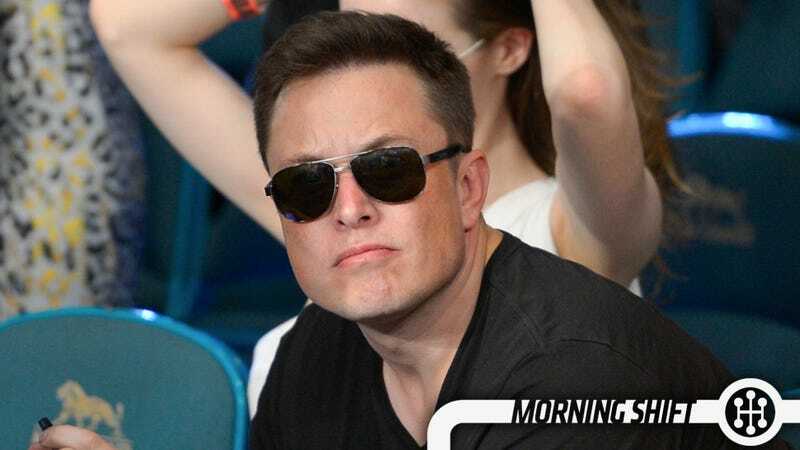 Neutral: What's Elon Musk Worth As CEO? He's taken a company almost no one thought would survive and lead it to a market cap larger than some country's GDP. What's that worth?